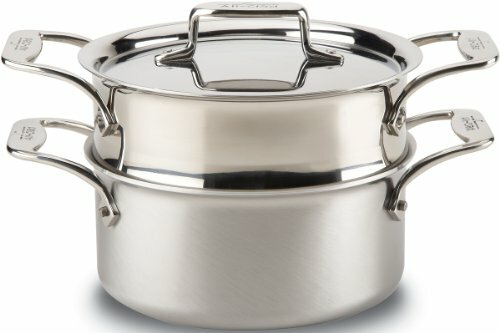 This All-Clad D5 STAINLESS Brushed BD55303 W/ST (2) 3-Quart casserole with steamer features high, straight sides with a smaller surface area that holds heat well while limiting evaporation. Ideal for boiling or blanching a wide variety of foods or simply reheating smaller batches of soups, chili, and vegetables, the versatile casserole can be used to cook, warm and serve. The only cookware of its kind, All-Clad D5 STAINLESS features a patented technology of five alternating layers of responsive aluminum and durable heat-diffusing stainless steel. d5 STAINLESS cookware heats slowly and evenly, which means perfectly browned proteins throughout, from the center all the way to the edges. The 5-ply bonded cookware’s 18/10 stainless-steel interior with a highly polished starburst finish offers natural stick resistance, and prevents food from picking up a metallic taste, while its fingerprint-free brushed stainless exterior offers exceptional beauty. Made in the USA, All-Clad d5 STAINLESS cookware provides pouring lips, large handles with bolsters, dishwasher-safe convenience, and is optimized for induction. Experience a lifetime of cooking enjoyment with All-Clad D5 STAINLESS.